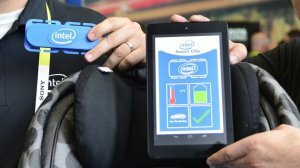 LAS VEGAS – Amid all the fanfare over a new button-sized computer, robots, 3D cameras, and new processors from Intel this week at the International Consumer Electronics Show (CES) 2015, there were a couple of sleeper devices that weren’t being hyped much by the company. One was the Compute Stick, a $149 Windows 8.1 or Linux computer that plugs into your TV that will be available in March. 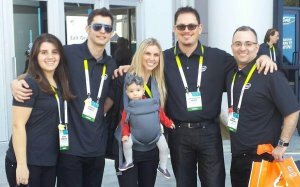 Another one was the Intel Smart Clip, a prototype car seat toddler tech device that may hold promise to prevent tragic accidents with children being left in vehicles. Every year, dozens of children die in the U.S., mostly from heat stroke, after being accidentally left in vehicles, In most cases, according to KidsandCars.org, a public interest group, the person responsible for the child’s death unknowingly leaves them in the vehicle. One of those events happened late last year to an Intel employee. Smart Clip prototype being shown at CES 2015. 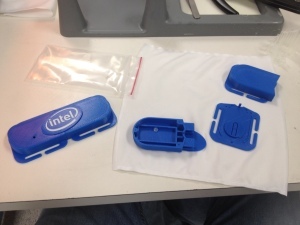 The Smart Clip prototype shown at Intel’s booth at CES could be a solution. The device and accompanying app remarkably went from concept to a full working demo in just a few weeks leading up to the show, thanks in part to 3D printers that were able to make the clip in rapid fashion. 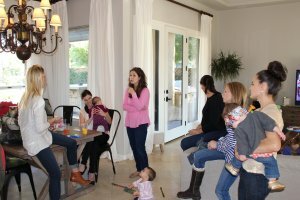 Marcie Miller, a new mother and an engineer within the company’s Internet of Things Group was asked in November to evaluate possible solutions that would prevent accidental deaths. As an Arizona resident, who once worked for the Arizona Cardinals as a professional cheerleader while also holding down her day job at Intel, Miller knows all too well of the dangers of high temperatures. Indeed in one case, the CEO of a hospital in Iowa inadvertently left her child in her minivan as she was rushing to attend meetings. The child died from heat exhaustion. Miller gathering feedback from local focus group. With encouragement and support from her management, a small team comprised of Miller along with four other Intel engineers tested and evaluated existing safety reminder systems. Some existing safety devices on the market require parents to carry around a wireless fob, which can also be misplaced or forgotten, or don’t report temperature devices. The team surmised that the best control system is one that’s as seamless as possible and believed that a smartphone would most likely to always be with a parent or caretaker, and sought to build a system that would interface with an app rather than an additional accessory that could be forgotten in the car itself. The Smart Clip team was able to make this concept a reality in just weeks thanks to 3D printers. Based on that research they were able to design, prototype, test, and produce a working device in the few weeks between Thanksgiving and the New Year. The team included hardware engineers, 3D printing and prototyping experts, and android app developers; even Miller’s own daughter contributed by being a test participant. The team would even take their work where so many products have their beginnings: one of the team member’s garage. The Bluetooth-enabled device operates like a safety buckle while also connecting to a smartphone app that will report back on ambient temperature and the Smart Clip’s remaining battery life. The most important feature, however, is that it will send an alert should the Smart Clip still be enabled while falling out of range with the smartphone, preventing a forgotten toddler from being left behind. While the device in its current form is just a prototype, Miller said that her team is working with a multinational partner to bring this device to market, but development won’t stop there.